Side: The vascular tissue and the pericycle form a tube of conducting cells called stele. Xvlems are present in the centre of the root. Xylems are composed of tracheids and vessels. The xylem of the root is continuous %s al) the xylem tissue in the stein. The xylem tissues are surrounded bs the phloem tissues. –Ilk xn. 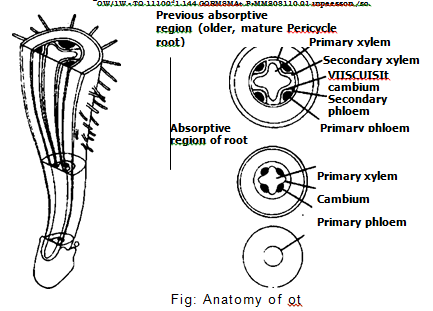 lem and phloem elements (vascular tissue) are surrounded by pericycle. 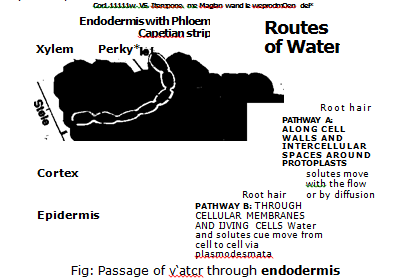 Endodermis: Endodermis is a laser of cells present outside the stele. The transverse and radial cell s, ails of endodermal cells have Casparian strips. ‘Mese strips are characteristics cell wall thickenings. These are impregnated P. ith suberin. Suberin is impermeable to ssater. Therefore. the water with its dissolved substances cannot pass out of endodermal cells. Cortex: Cortex is present outside the endodermis. It is composed of several layers of large thin-walled living cells. The intercellular spaces are present among these cells. The cell wall of cortical cells are highly permeable to u.ater and its dissolved solutes. Epidermis and root hairs: The cortex is surrounded by a layer of epidermis. They are flattened cells. The outer salts of root epidermal cells elongate. It forms thin-‘ ailed hair-like structures called root hairs. These root hairs spread in the soil particles. Most of the uater enters through the root hair, and their associated epidermal cells. 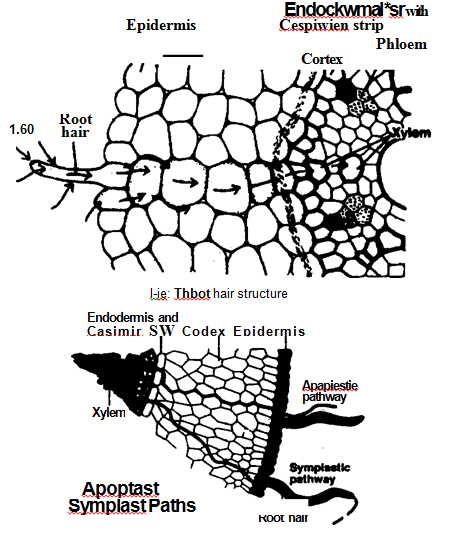 here are three uater path a‘ s thniugh root adjacent cell walls is called apoplast pathway. The interconnected cell walls and water filled xylem elements form single system called apoplast. The apoplast is 2ontinuous throughout the plant except for the Casparian strips in the roots. Symplast Pathway: The movement of water through the protoplast of the plant cells is called symplast pathway. The interconnected protoplasts in the plant are called symplast. The cytoplasm of the neighbouring cells is linked by the plasmodesmata in the cell walls. Vacuolar Pathway: The movement of water molecules From vacuole to-vacuole through neighbouring cells is called vacuolar pathway.